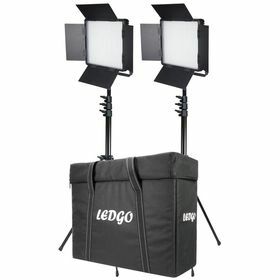 Datavision (DVS-LEDGO-600LK2) Duel LEDGO LED 600 Daylight Dimmable Location Lighting Kit with, 2x stands and Carry Bag. The LEDGO panels have been independently tested. The TLCI results are astonishing, with the 600 range performing at the possible highest level. They are considered to exhibit "errors [which] are so small that a colourist would not consider correcting them."